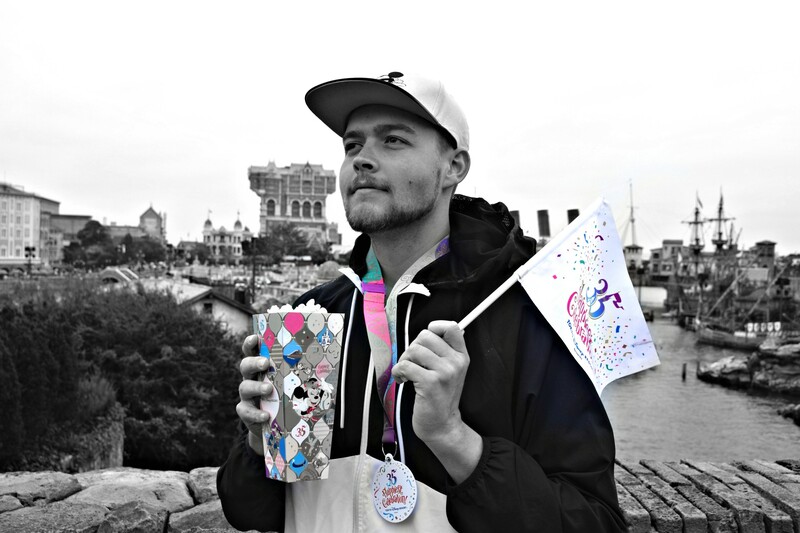 Sean: As you may know we visited Shanghai Disneyland a few weeks back, and we had an absolutely amazing time. 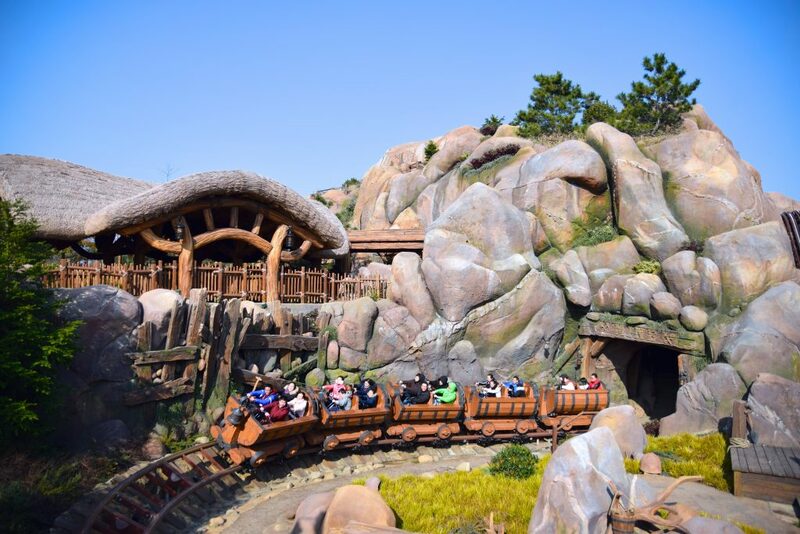 Instead of a trip report, I decided to make it a bit more structural and discuss each of the 6 themed lands at Shanghai Disneyland, their attractions, and my thoughts on them! 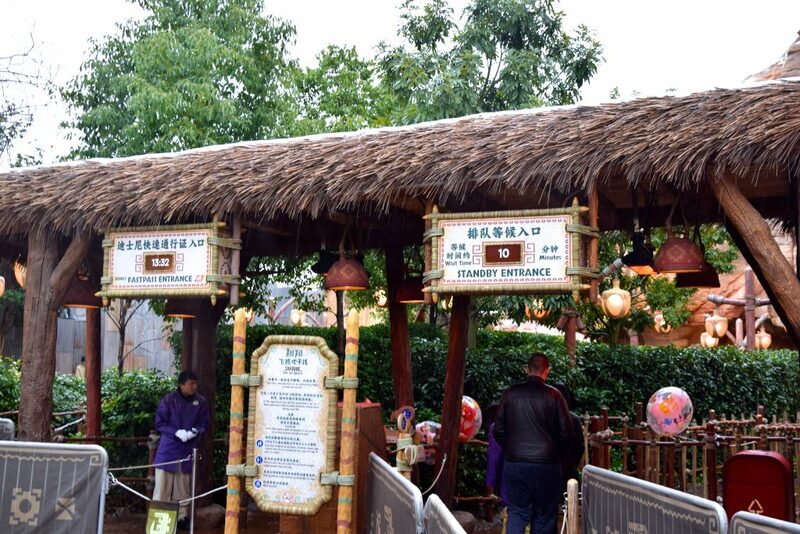 The entrance to the park is beautiful, it is all set up to be grand. 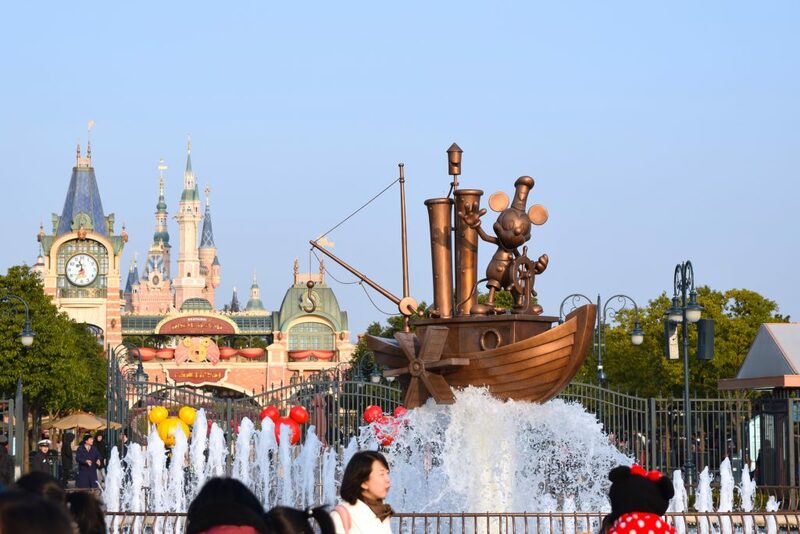 The little mickey steamboat fountain outside of security is just the beginning. 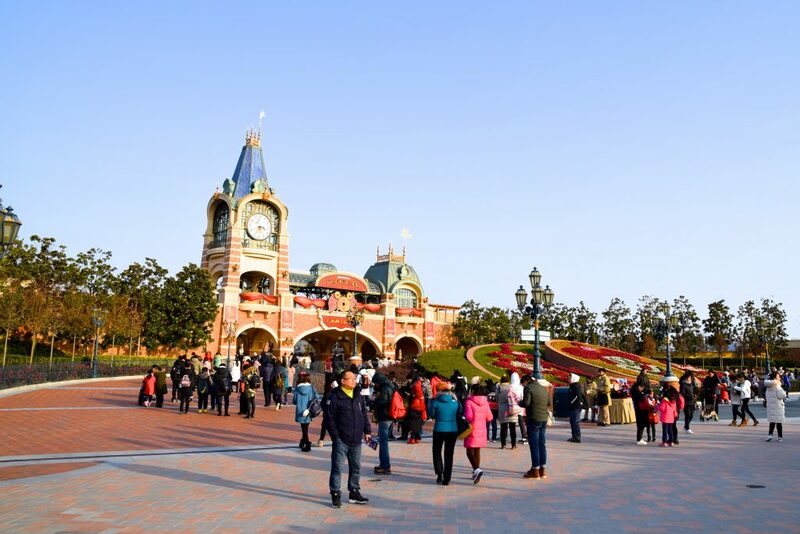 Shanghai Disney may not have an actual railroad around the park, it does have a stunning train station. And it really is beautiful. 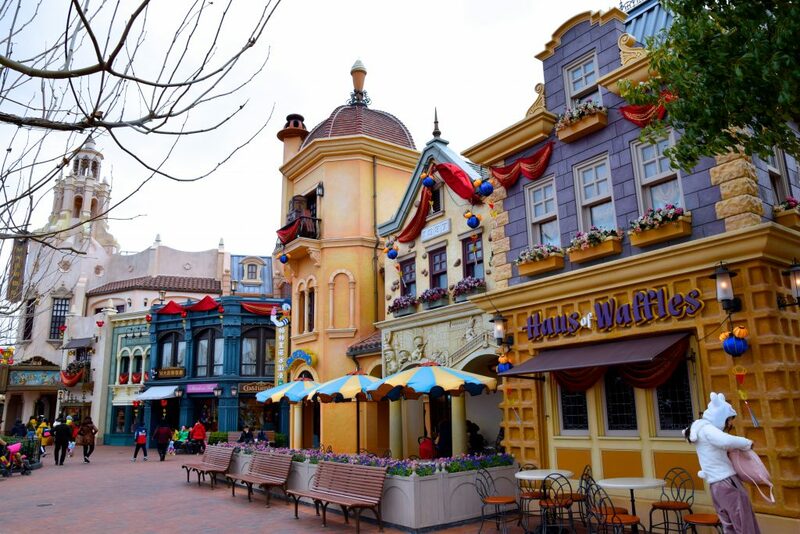 Rather than having a Main Street USA section, the park features Mickey Avenue, a square of shops, restaurants and meet ‘n greets, that cuts out the long walking to get anywhere. 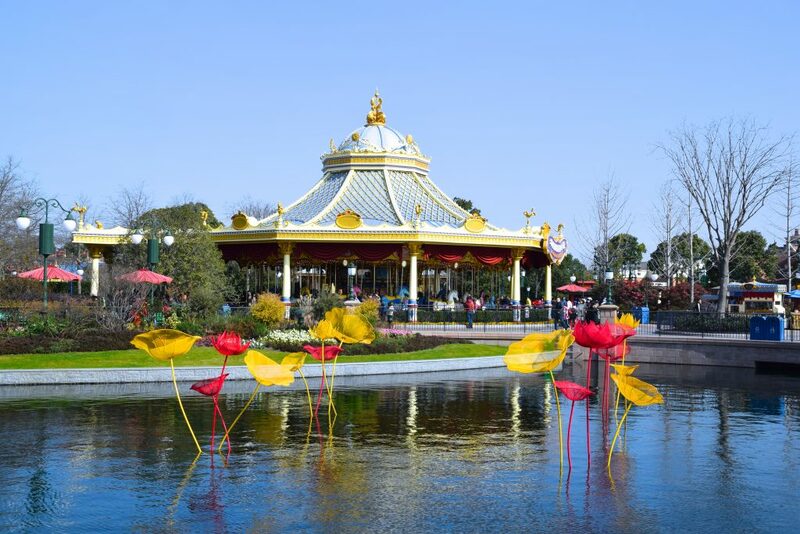 Let’s start with the Gardens of Imagination, which is pretty much this park’s hub. Beautiful gardens that are particularly great for special events, also allow for superior castle-show viewing, along with of plenty of photo opportunities. But that’s not all! 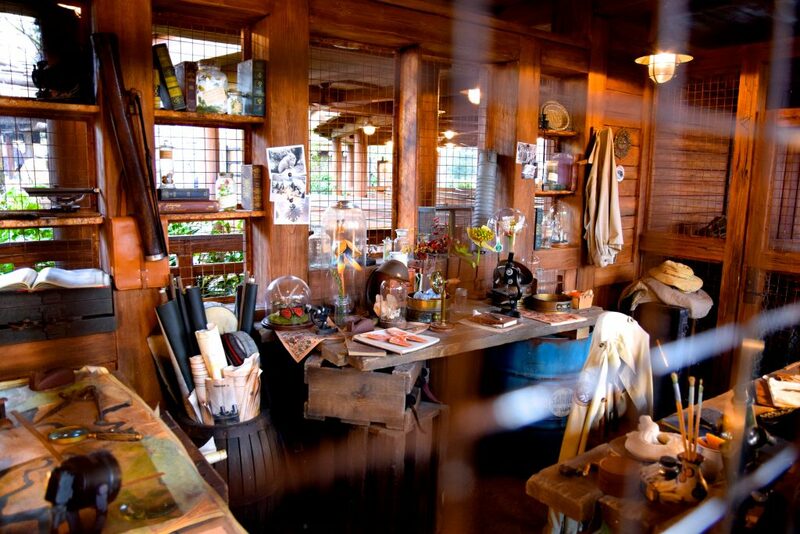 The Gardens of Imagination is home to several other attractions that aren’t just the massive castle. Such as the park’s carousel, named Fantansia Carousel, shown below. Also in the area is the Dumbo ride that we see at all Disney resorts! And then of course there is the castle. 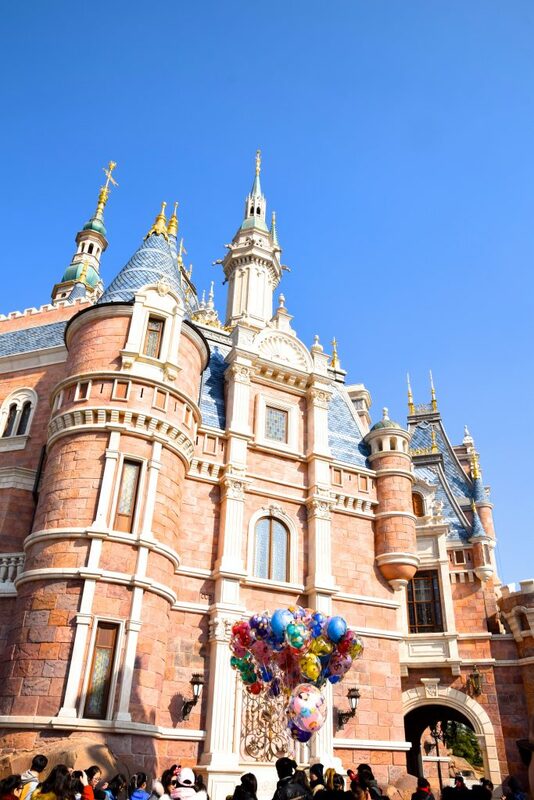 This is Disney’s biggest castle, complete with its own attractions inside, and rather than it being dedicated to one certain princess, the castle is actually a combination of all your dreams and is appropriately named: The Enchanted Storybook Castle. 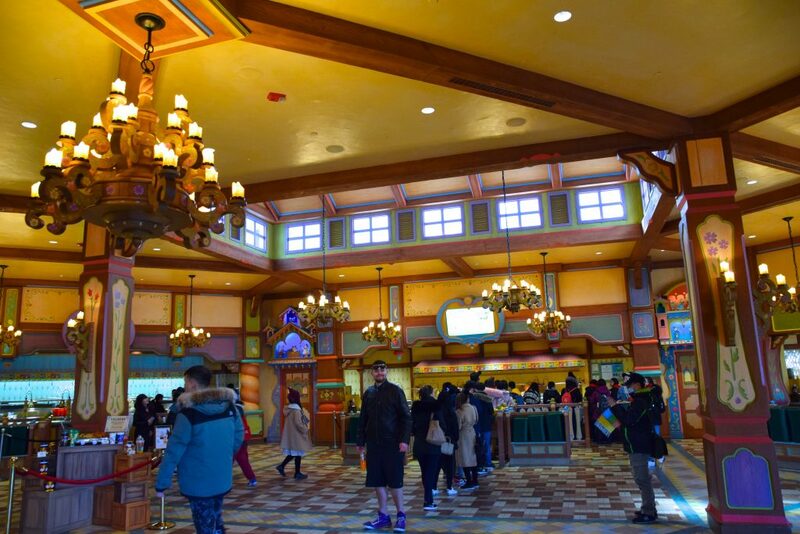 Also part of the Garden of Imagination is the set of stores and restaurants that are located along side area. A cool note, the tops of some of these buildings double as viewing platforms for the castle-show! 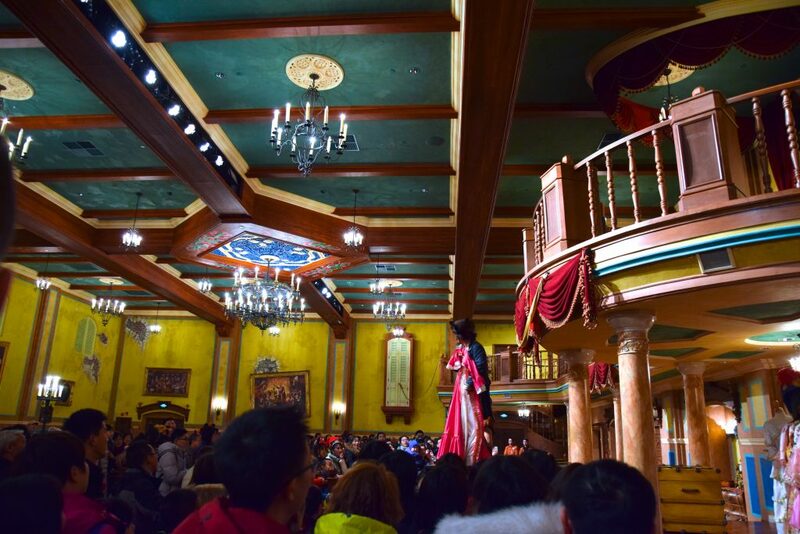 In case you wonder how large the castle is compared to the others, note that up in the castle there is an open air courtyard, and down below a giant stage with several dozen dancers. This castle is HUGE. Let’s head over to Fantasyland, where we find some classic Disney attraction in a new life form, as well as some brand new attractions. 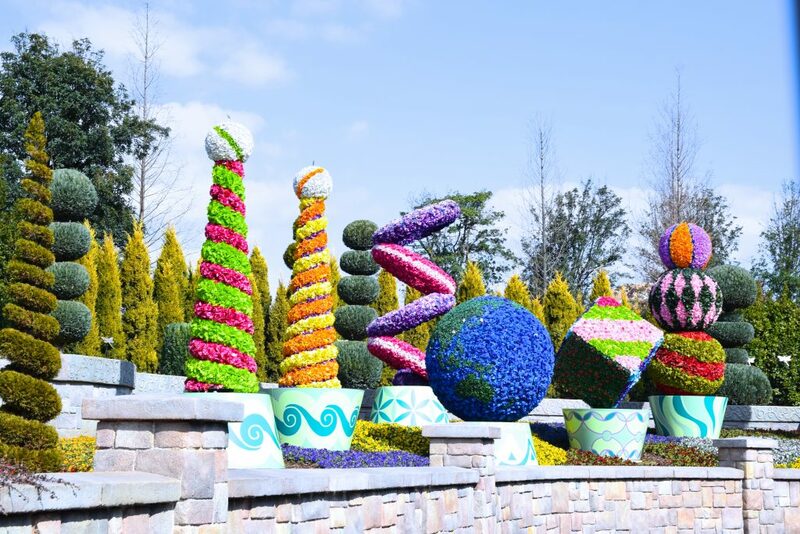 Instead of Jungle Cruise, Shanghai Disneyland has Voyage to the Crystal Grotto, which replaces animatronics of wildlife with animatronics of Disney stories! 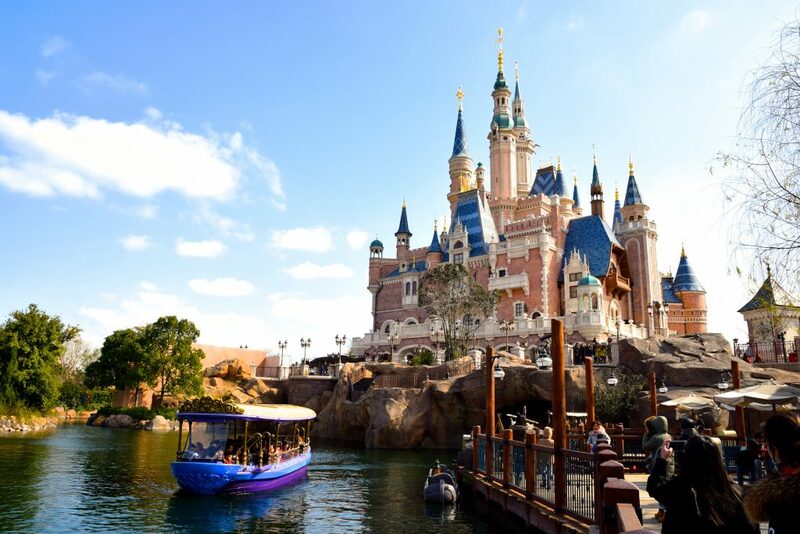 The Voyage to the Crystal Grotto boat ride is located along side and below the castle, making for a very scenic boat ride. 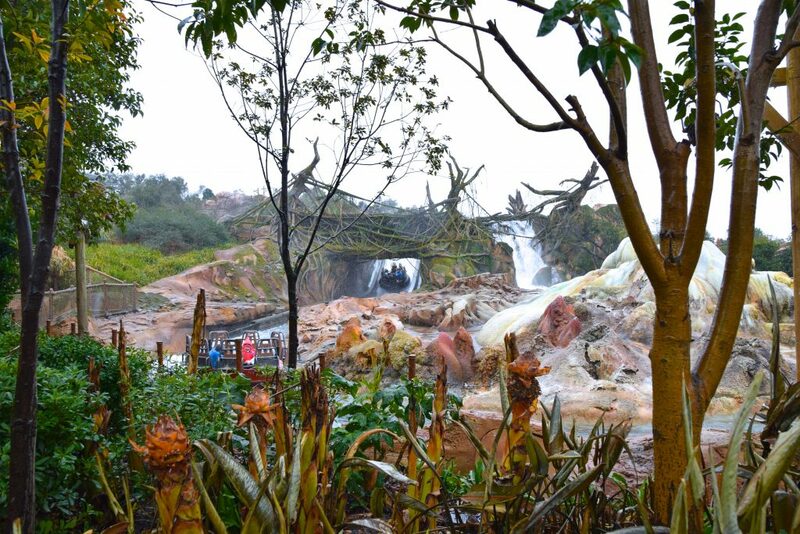 The ride includes plenty of awesome landscaping. 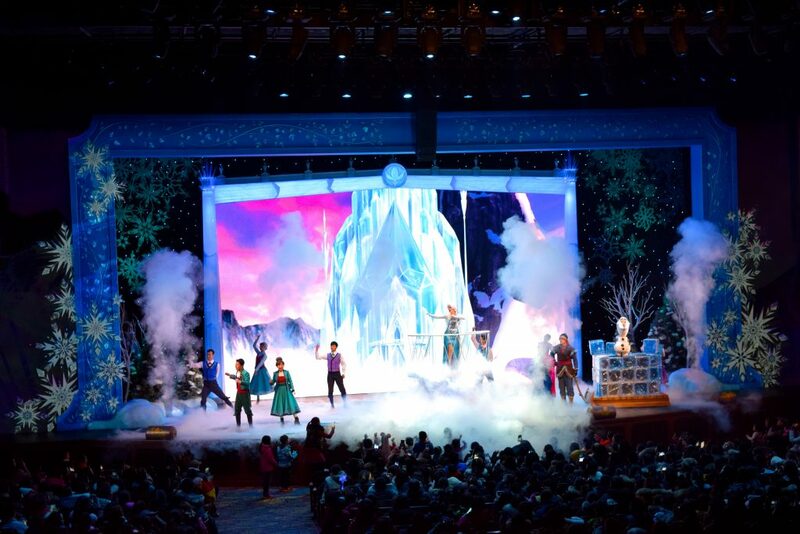 As well as some classic Disney scenes brought to life with some basic effects. Overall the ride is fun, different, but lacks any sort of spectacular finale, the indoor castle section is pretty, but that’s about it. 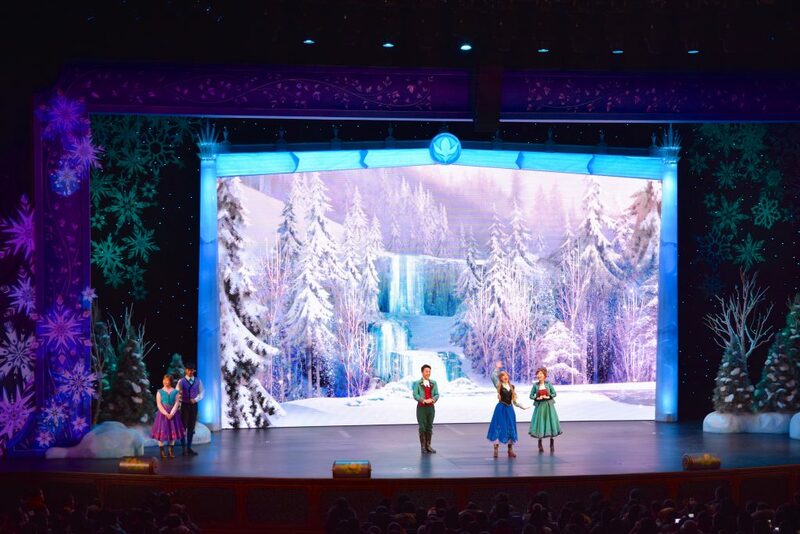 Fantasyland is also home to a giant theater, where the infamous Mandarin version of the Frozen Sing Along show can be found. 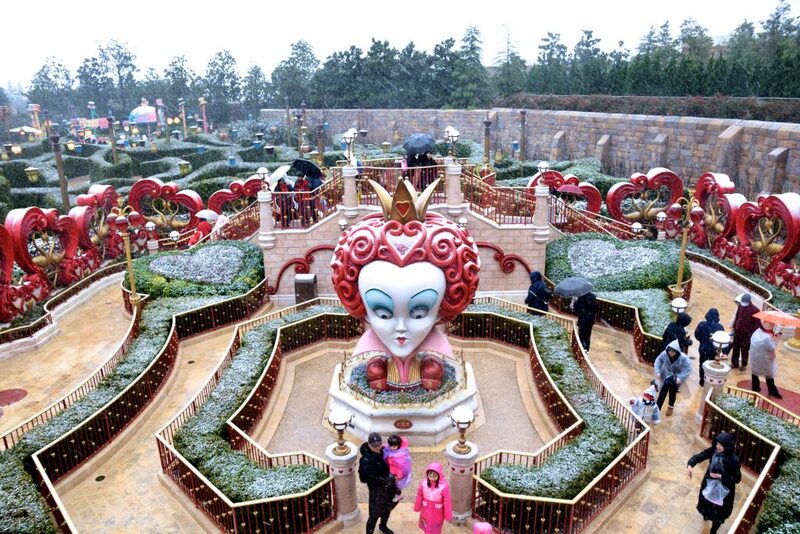 It was actually snowing outside, so the park was empty, but this show was still crazy busy. People are obsessed with this show! 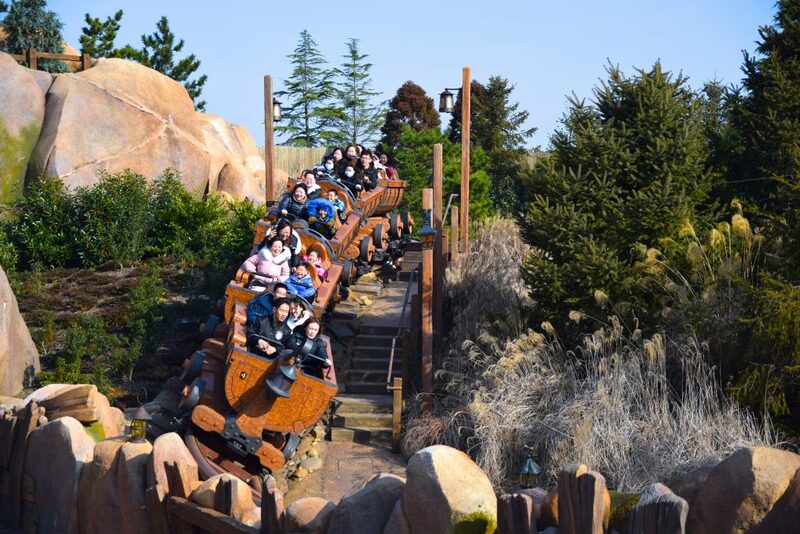 And we were obsessed with Shanghai Disneyland’s Seven Dwarfs Mine Train! 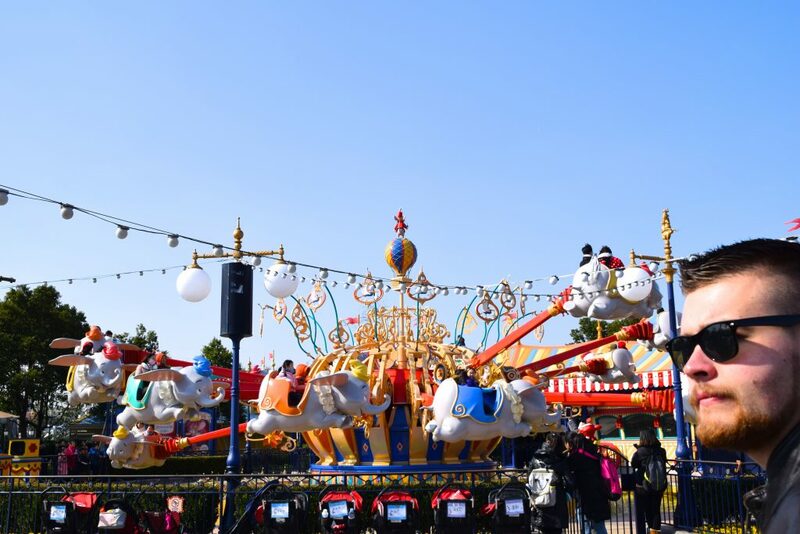 The ride has a family feel to it, is not very long, but has some surprising elements, a dark-ride section, and is so incredibly smooth thanks to the swinging cars. Believe it or not this ride has some airtime! 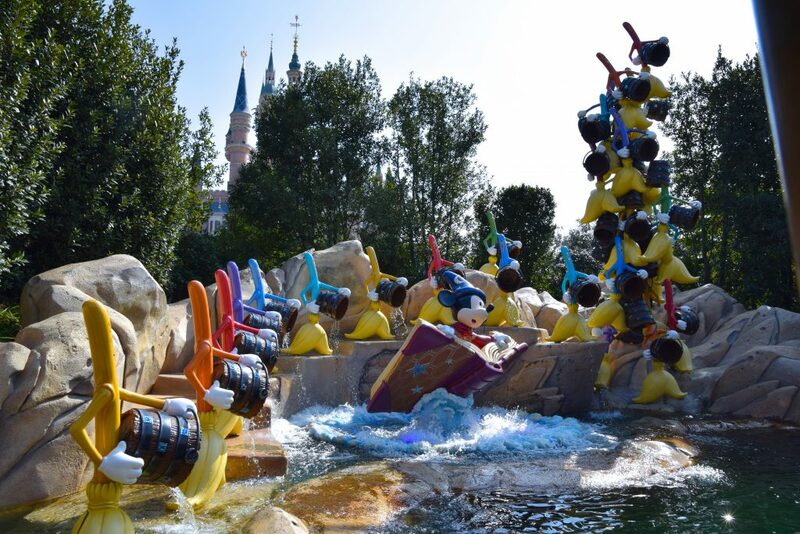 This is by far the area’s most impressive attraction, and it was quite popular during our time at the park. Particularly when it wasn’t snowing. 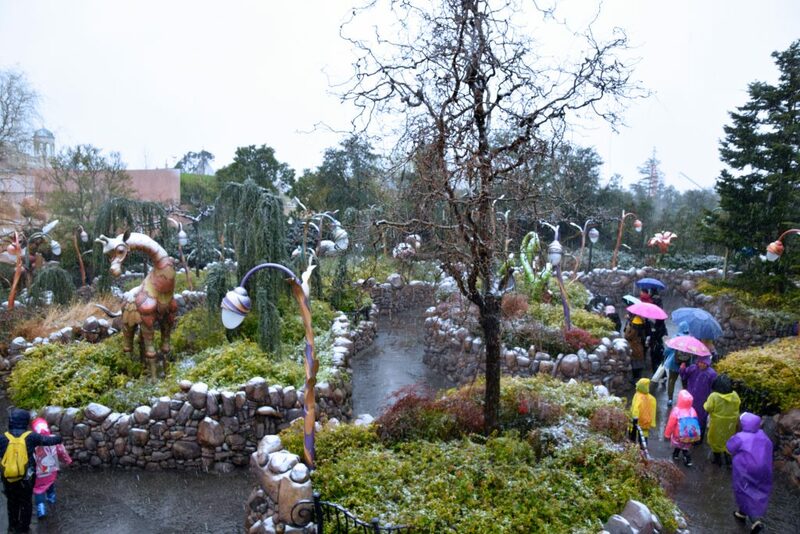 Another large attraction is the Alice in Wonderland Maze, which is a pretty large maze, one that we didn’t spend too much time exploring, it is absolutely stunning when dusted by some snow though. There isn’t a single area at this park that is not absolutely stunning, though some are even more amazing than others. 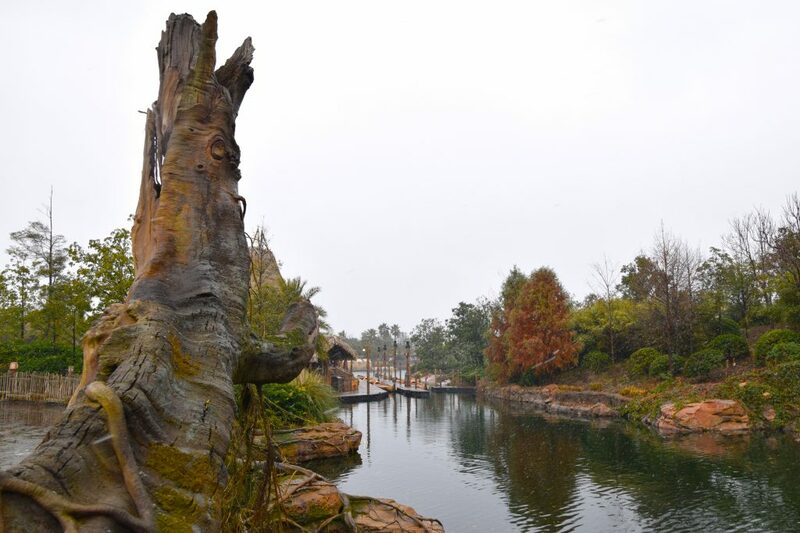 Treasure Cove and Adventure Isle make up for half of the park, and it is beyond gorgeous. 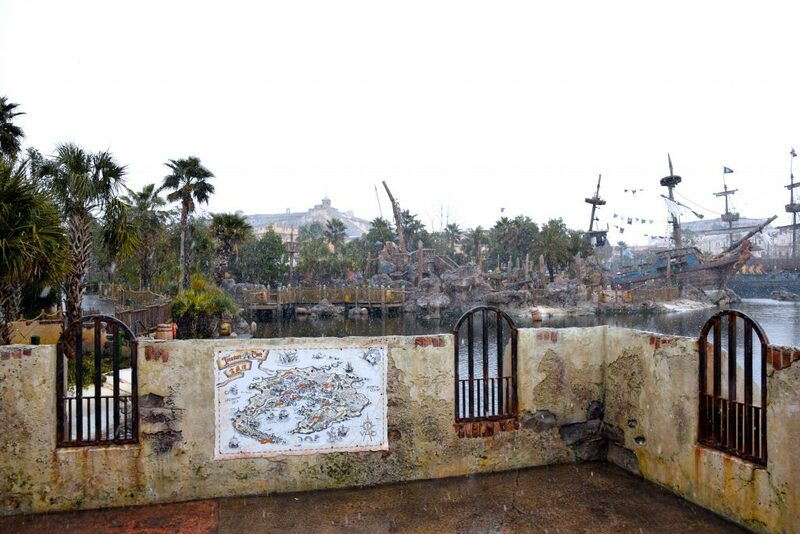 Across the lake, you see both Pirates of the Caribbean and Adventure Isle, which we’ll get to shortly. 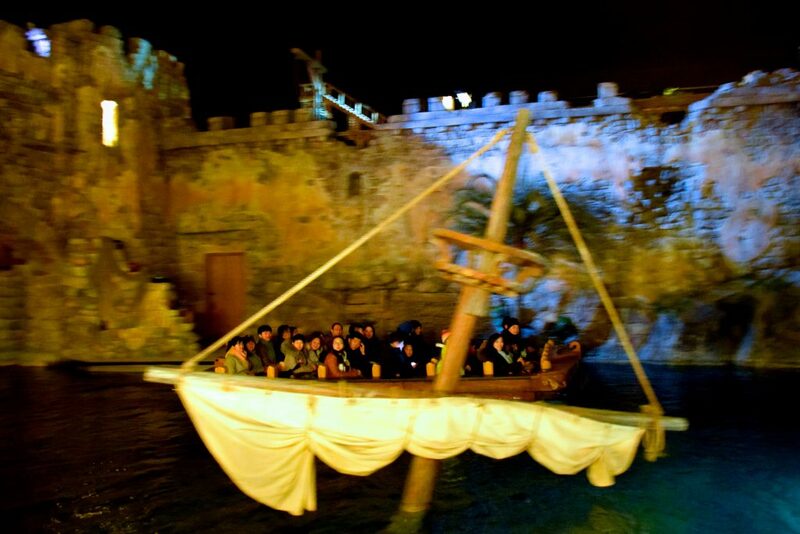 Let’s start with the park’s marquee ride, Pirates of the Caribbean: Battle for Sunken Treasure. 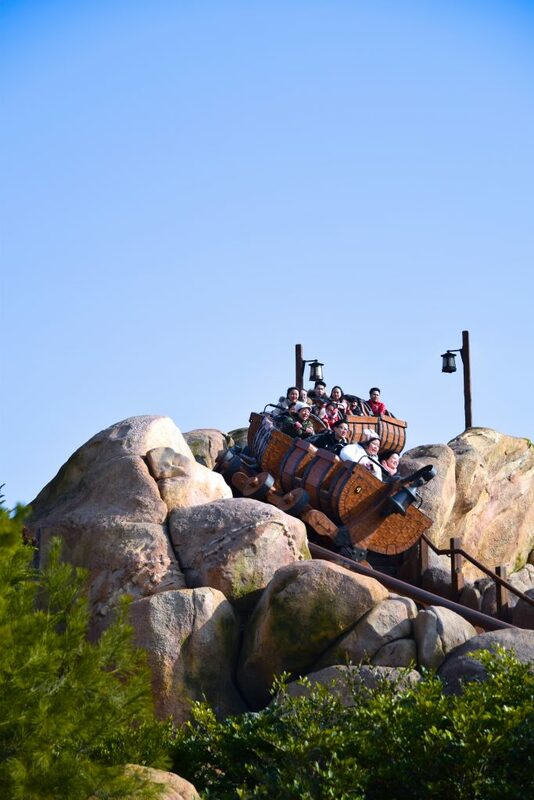 This is not only the park’s most visually stunning attraction, it is probably Disney’s best work ever. It is just jaw-dropping good. And I’ll tell you this much, I have never ever been so amazed by an attraction before, and often times I am hard to impress. 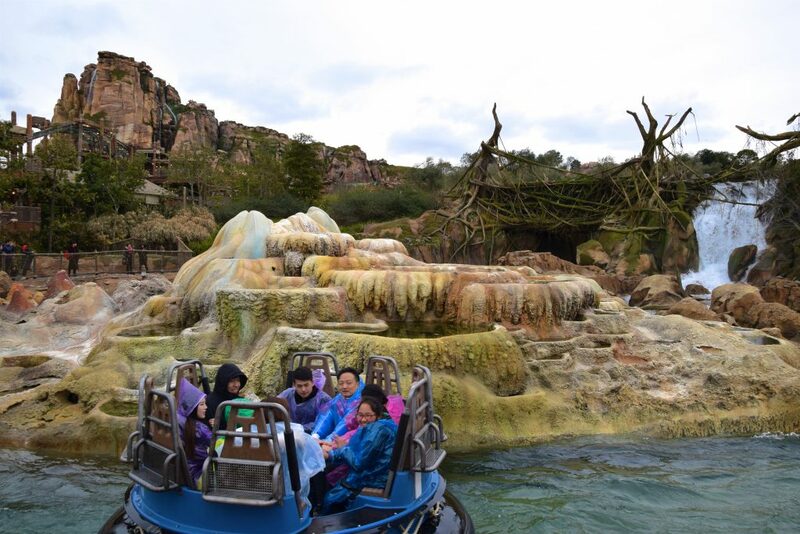 The capacity for this ride is also amazing, with 2 25-passenger boats dispatching every few seconds. The line is always moving and never long thanks to that amazing capacity game. 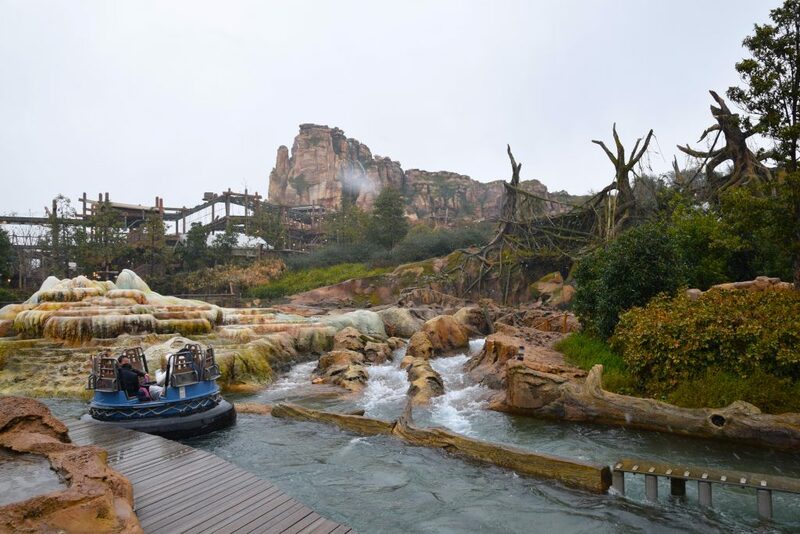 The ride utilizes tracks throughout the entirety of the course to move the boats forwards and backwards, and includes a rollercoaster section (gravity powered), the ride also utilizes giant projector screens, water effects, amazing animatronics, and several large physical scenes to create the most amazing attraction. (Everyone loves Tron, but there is no denying this ride is EVEN MORE stunning). 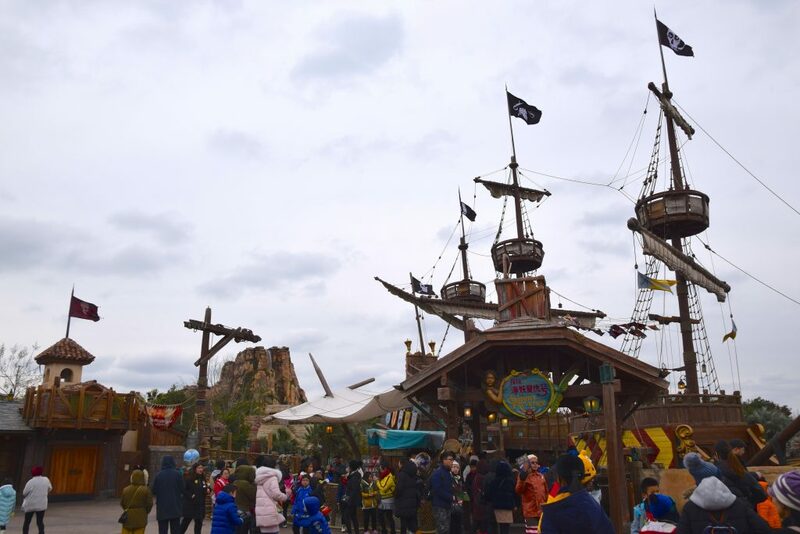 Shanghai Disneyland has a lot of walk through attractions, including the pirate ships at Treasure Cove! 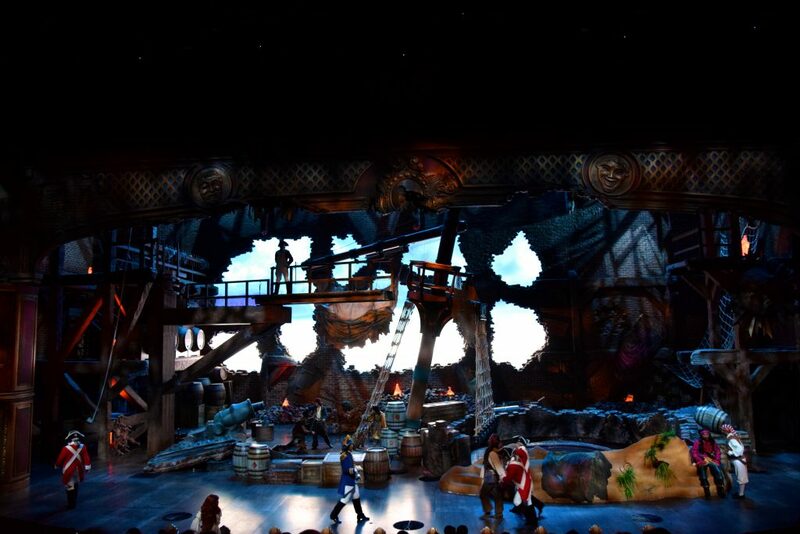 Another very cool Shanghai Disney exclusive is the Pirates of the Caribbean stage show, Eye of the Storm, which starts off with an elaborate but hard to follow pre-show. 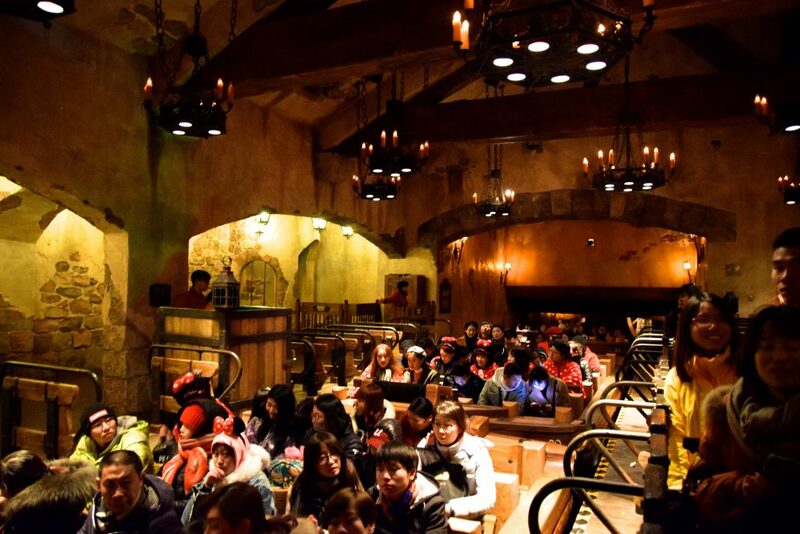 Then leads guests into a theater, which is relatively compact. But features a spectacular stunt show! 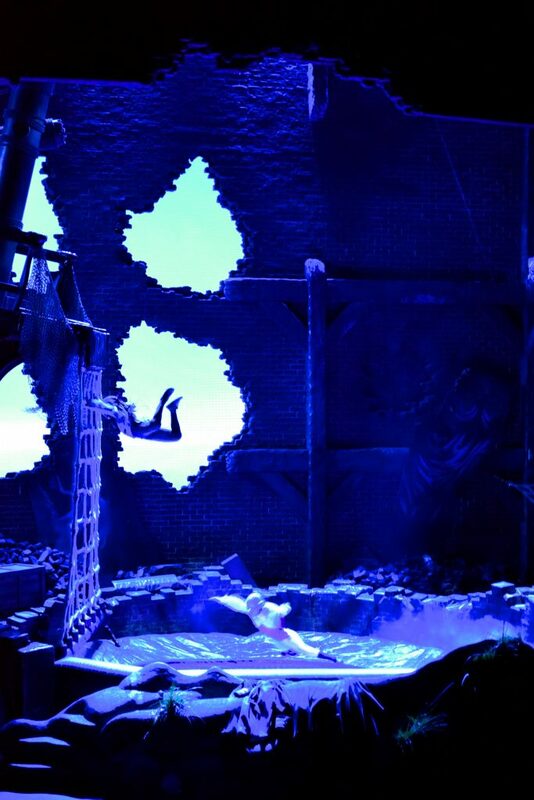 With indoor sky diving stunts as the show’s main spectacle. I approve of Treasure Cove, ESPECIALLY Pirates of the Caribbean: Battle for the Sunken Treasure. Right next to Treasure Cove is Adventure Isle, which is home to several marquee attractions at the resort, including Soarin’ Over the Horizon. 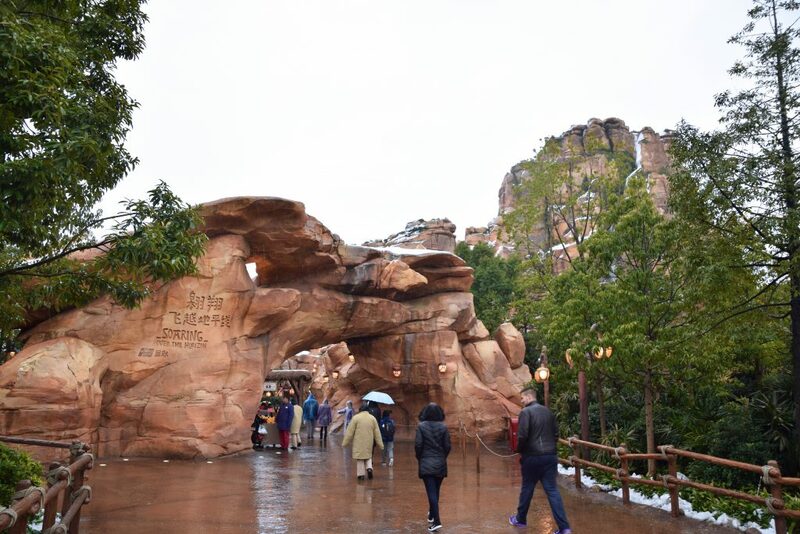 Usually this is the most popular attraction at the park, with lines that reach 3 hours in wait times daily, but the first ever snow at the resort reduced that queue to a mere 10 minutes for us. 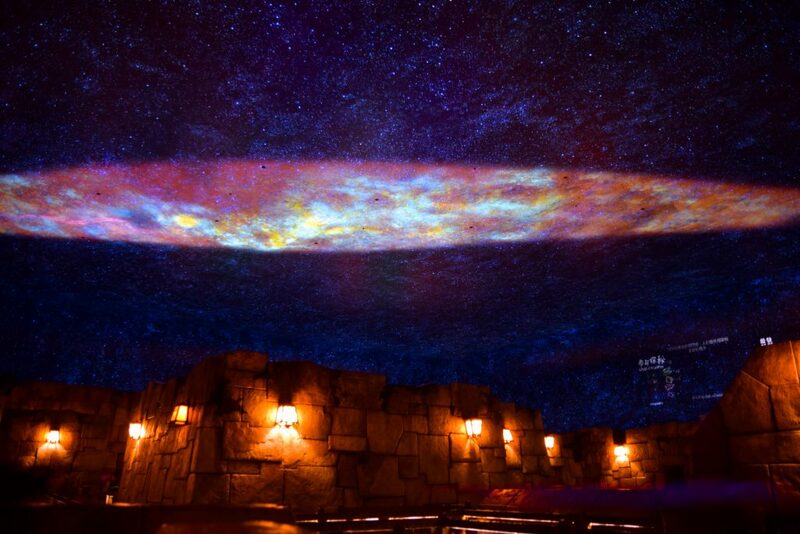 This is one of the park’s more impressive queues, with a nebula ceiling that includes interactive games, because the line for this attraction just gets outrageous. The pre-show for this particular installment of Soarin‘ is Latin American and spiritual inspired, offering a bit of a different atmosphere than the others do. 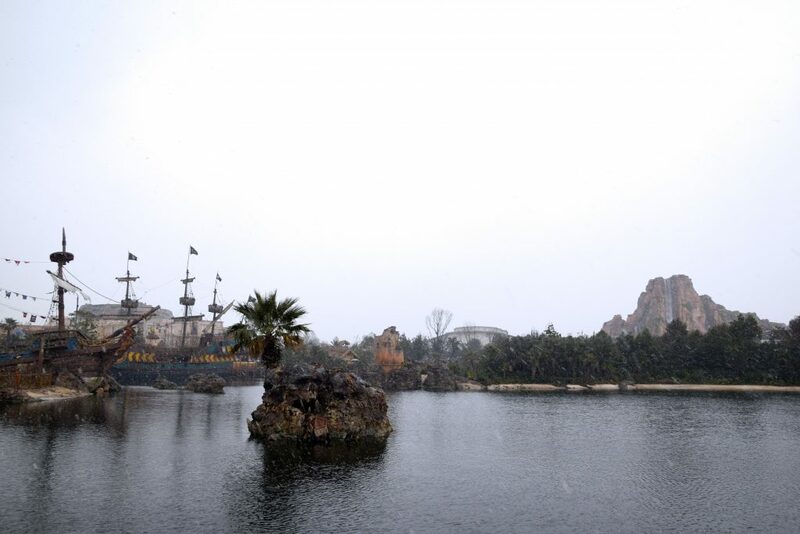 We spend quite some time at Adventure Isle during heavy snowfall. 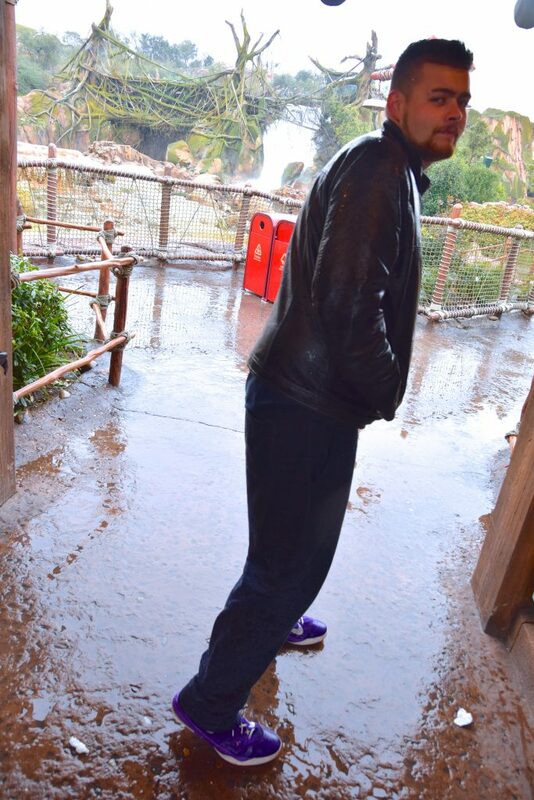 The weather at the park was well below freezing, and yet the park ran all rides, including Roaring Rapids. I thought it was a risky idea riding this thing in the snow. But since our first few rides prior to the snow coming in were so amazing, I was excited to ride it again. 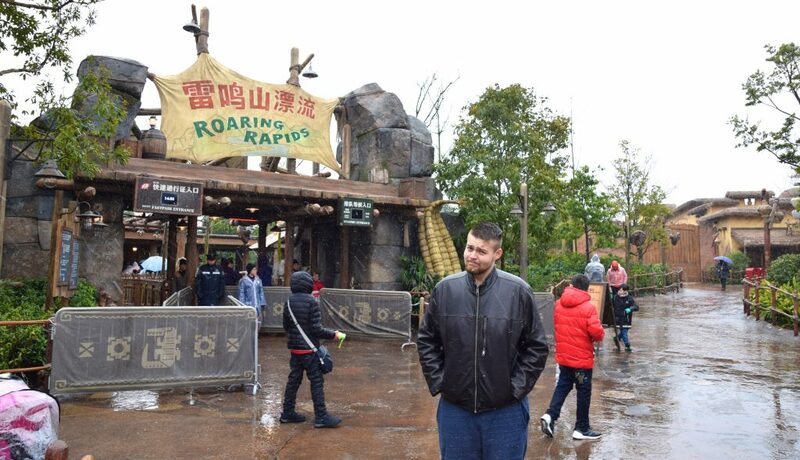 Besides this was the first (and perhaps the last) time that I rode a rapids ride with freezing temperatures and snowfall. The line’s queue, just like the theme, are a bit basic, kind of Indiana Jones meets rapids ride. The ride itself is massive and fast, perhaps my all-time favorite rapids ride. 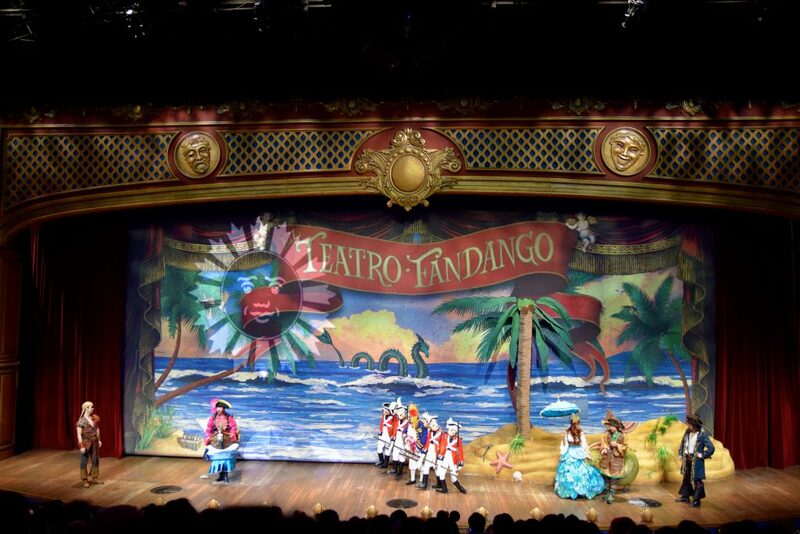 It is one of those rides that doesn’t at all use any IP, and is so well executed and long, the main animatronic on the ride is beautiful. The only issue are some of the indoor sight-lines that need major work still, even after the ride went through several closures to finish the ride. Here are a few more shots of the stunning tide prior to the snow hitting the park! Another attraction at Adventure Isle is the Camp Discovery adventure trail, which Alex had experienced before, but was too much of a time commitment to do while it was snowing out, so we skipped it. 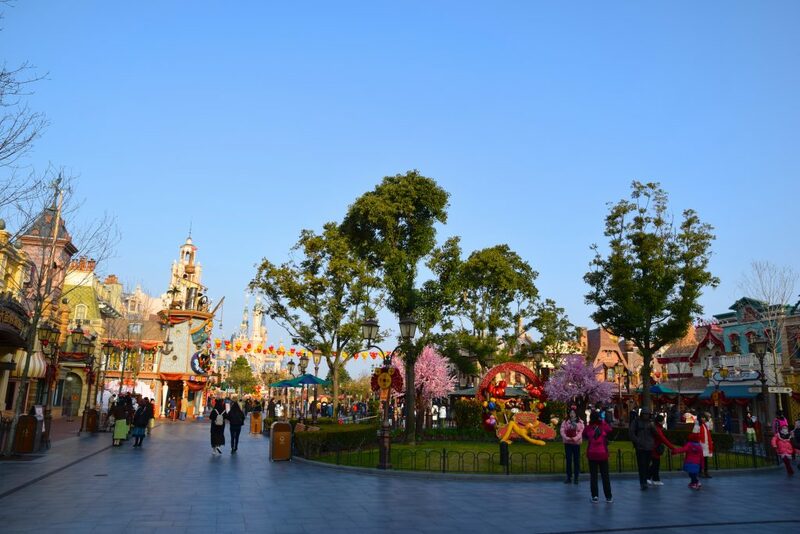 And last but not least… my absolute favorite area of the park… Shanghai’s Tomorrowland. In the dead center we find TRON, the obvious marquee attraction in the area. The whole area does an outstanding job feeling modern, clean, and durable. 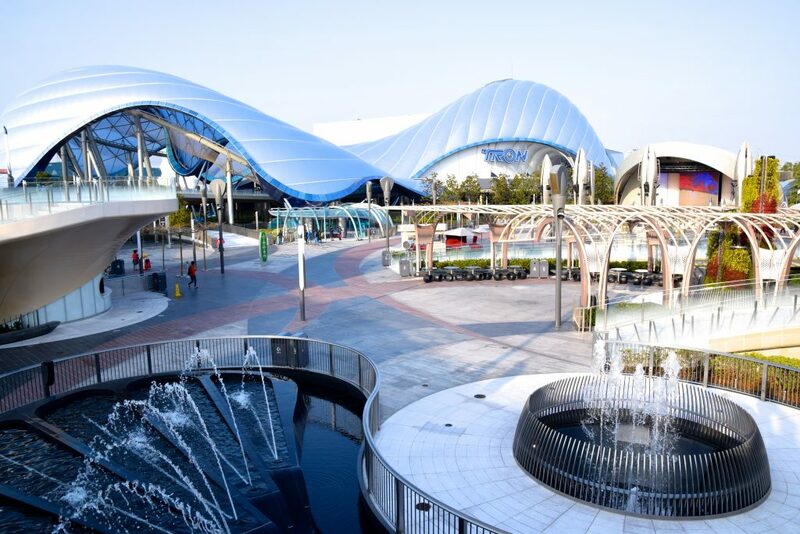 Rather than approaching the future theme trying to be futuristic, the area feels modern and feels like something that will feel modern 10 years from now. That’s more than any other Disney Tomorrowland (or variation thereof) has been able to provide. 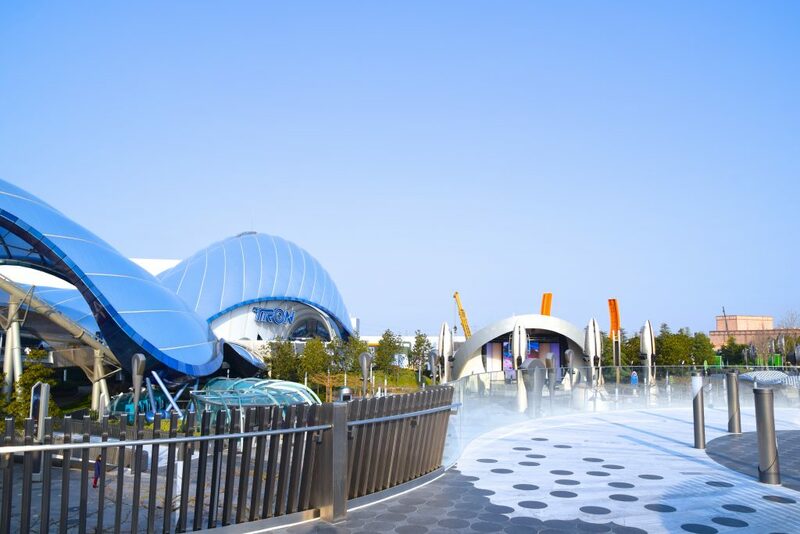 And the second level that is home to the Jet Packs, a restaurant, and the most amazing Disney Coaster of all-time, TRON: Lightcycle Power Run. 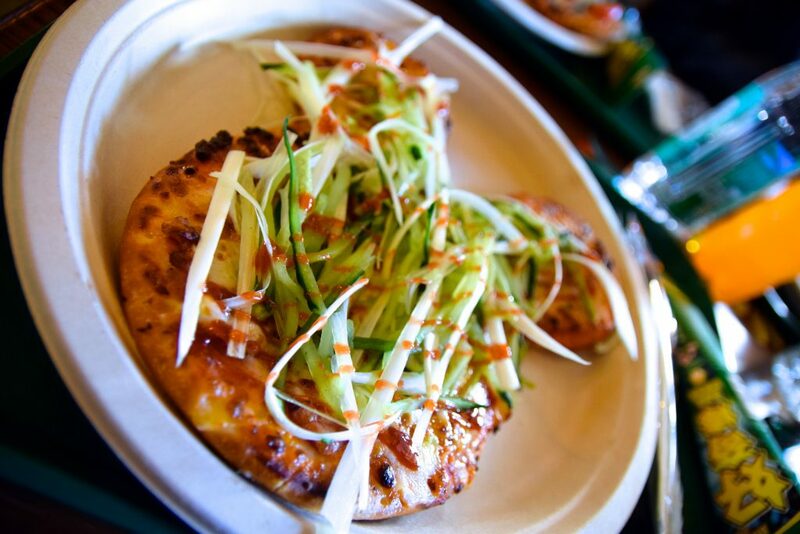 We wrote a big article on why we absolutely LOVE this ride, and we advise you check it out here. 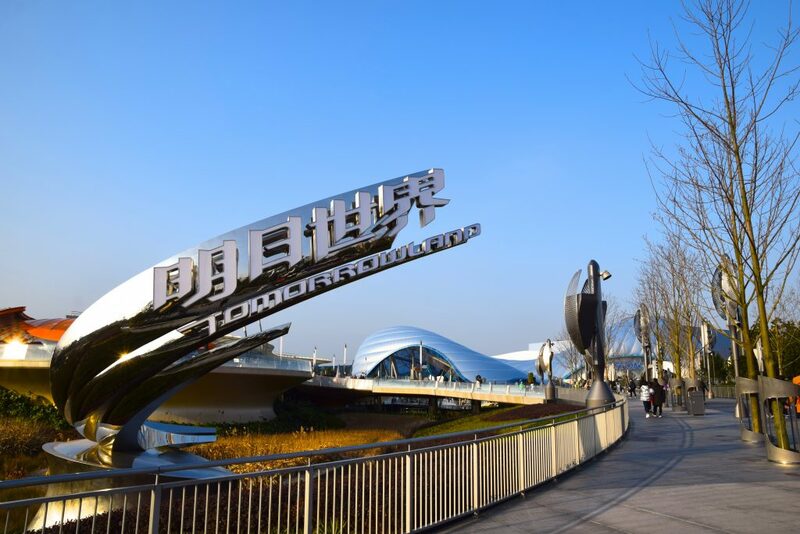 But here’s a bit of our opinion for you: The experience of TRON starts way prior to even entering the queue, the sheer size and impressive look is an attraction in and of itself. The queue is beautiful, has several great pre-shows, and is a perfect lead-in to the ride experience. The launch is significantly fast. Riding in the motorcycle position, launching at speeds of 60 MPH is just exhilarating. The coaster combines a high-speed thrilling coaster section with a milder indoor section that is just visually stunning. The ride thus manages to create much better rounded experience than most coasters are capable of delivering. 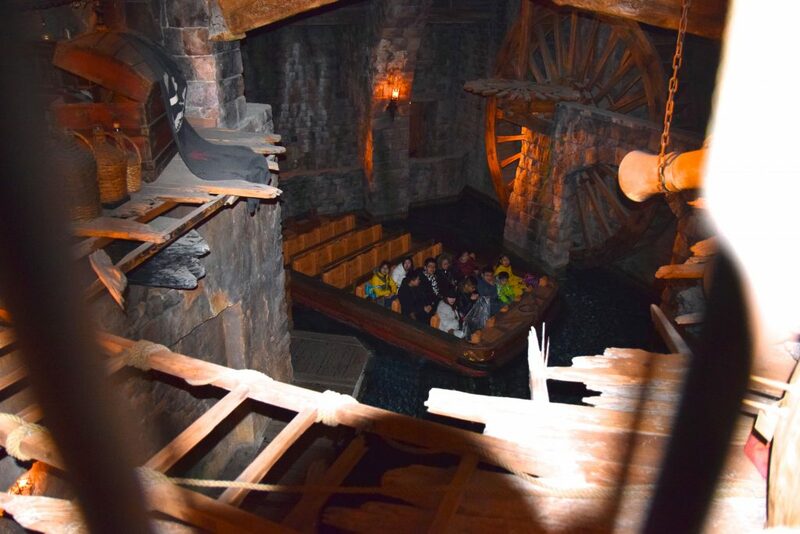 The immersion of the ride is beyond what anyone could have imagined, with several amazing effects throughout the ride. 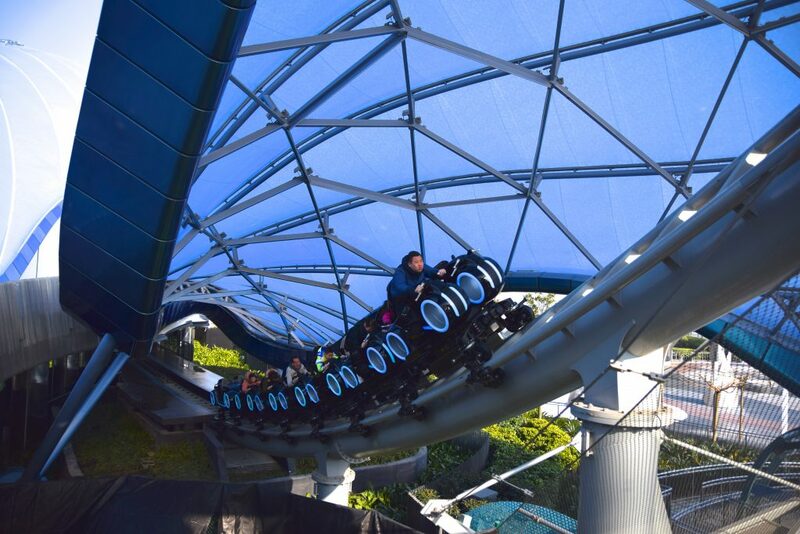 The ride’s lightcycle coaster trains are comfortable, efficient, very advanced, and amazingly beautiful. TRON: Lightcycle Power Run is purely spectacular. Out of this world fantastic and so well executed, and therefore is my favorite roller coaster. Tomorrowland is even more fantastic at night. The area is spectacular by day, and to die for at night. 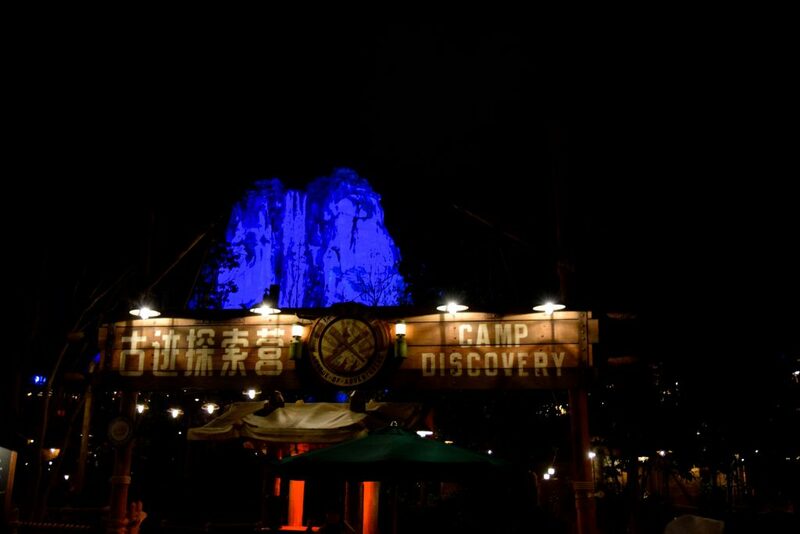 Not once in my life was I so impressed with a theme park land at night. 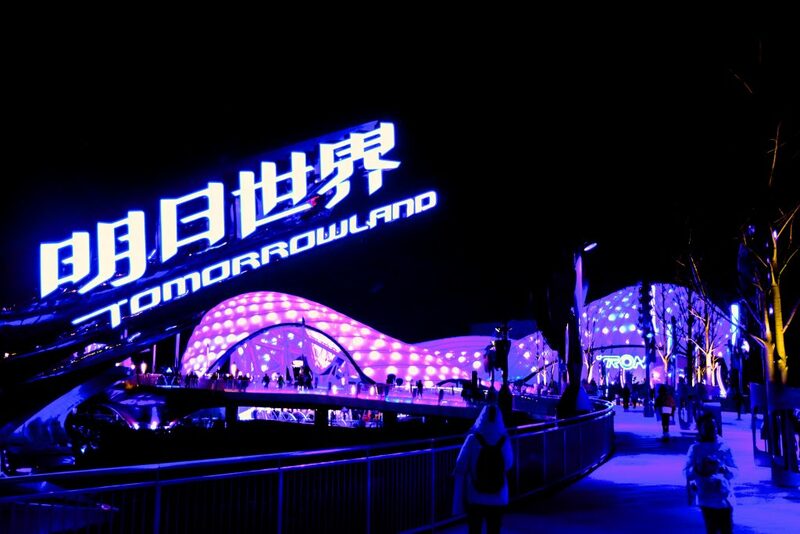 Tomorrowland Shanghai makes you want to cry. It is a stellar combination of perfect lighting, TRON’s remarkable presence, and surround sound music that immerses you in the simply modern, yet wondrous Tomorrowland. The marquee attraction, TRON, and it’s giant light up canopy radiate light and interact with the trains as lightcycles rush by. 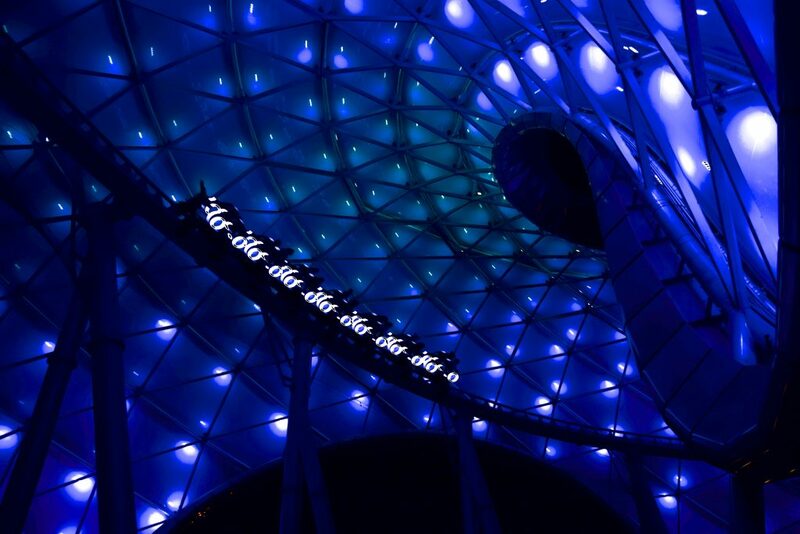 The ride experience on TRON is elevated to a new level during the night time, and just standing below the ride is a spectacular attraction in and of itself. Pictures, though awesome, can’t do the experience justice. And with a final picture of TRON, I want to write a final opinion of the park. 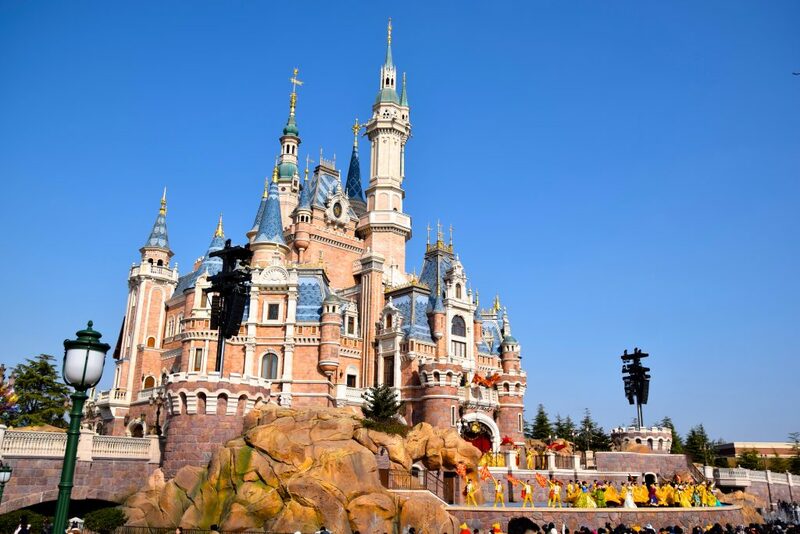 Shanghai Disneyland is one of the best executed pieces of themed entertainment in the world. 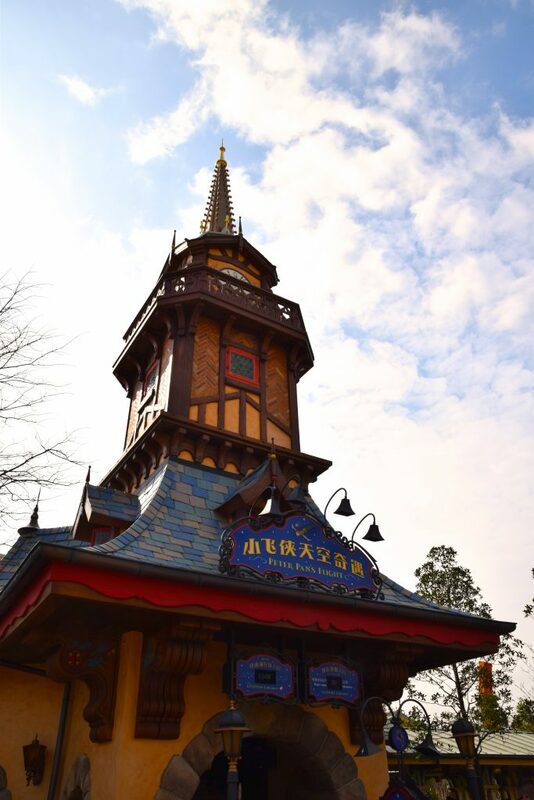 It is perhaps my favorite theme park I have ever been to, and for a park just over a year old (at the time of visiting) the park has such a complete roster that many Walt Disney World parks wish they were Shanghai Disneyland. 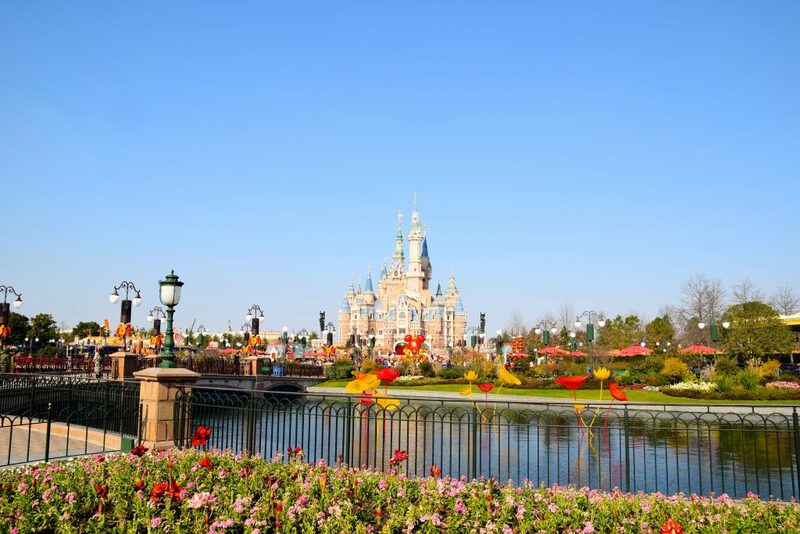 With several of Disney’s best attractions ever created, and a line up of stellar marquee rides in very well-developed themed areas, Shanghai Disneyland isn’t only an amazing park for attractions, but every step around the resort is a feast for the eyes. For many readers here it is quite out of the way, but travels to this park are more than worth it. 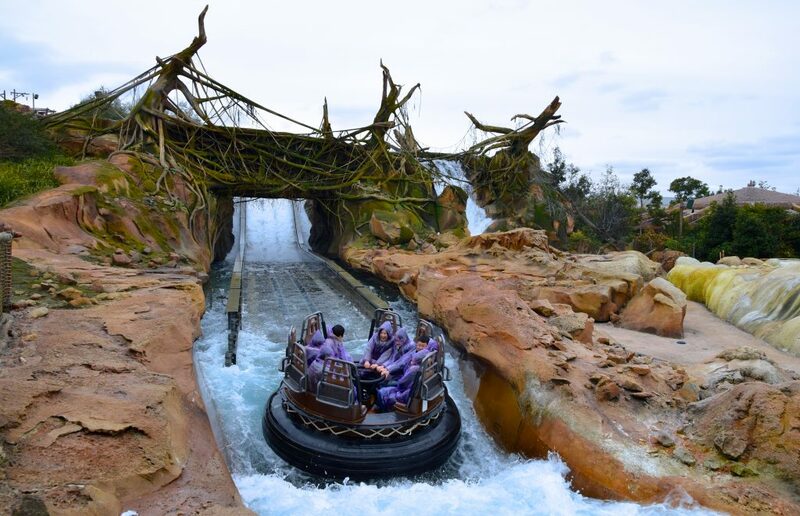 TRON and Pirates of the Caribbean are world-class can’t-miss attractions that, along with the rest of the park, have just elevated the standard at which theme parks are judged. Incredible. 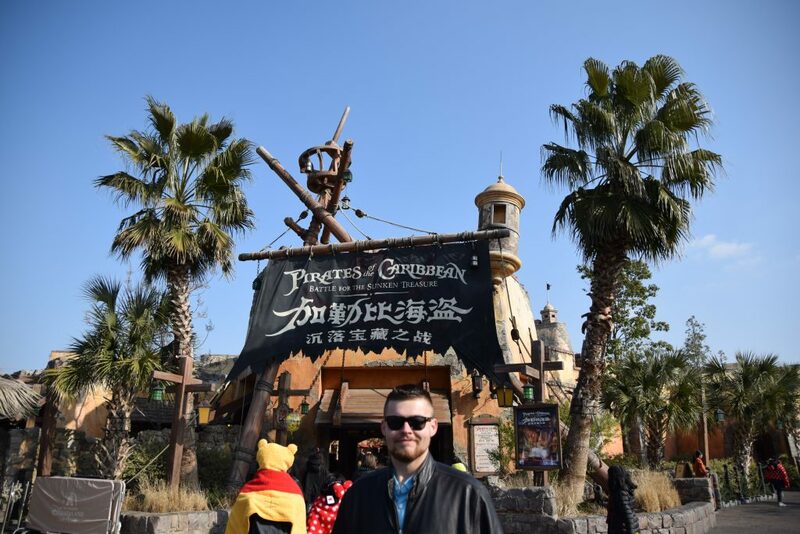 Thank you for checking out this little tour of Shanghai Disneyland. Make sure to check out our TRON: Lightcycle Power Run special! 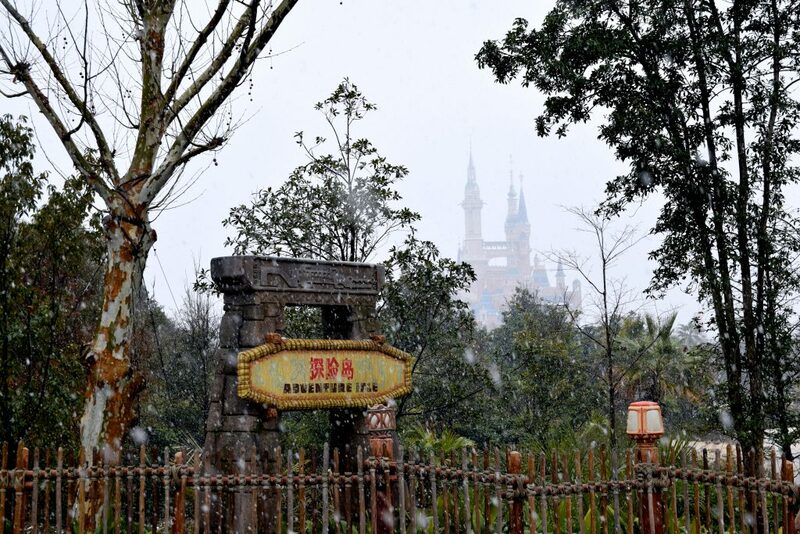 As well as our Shanghai Disneyland in the Snow article! 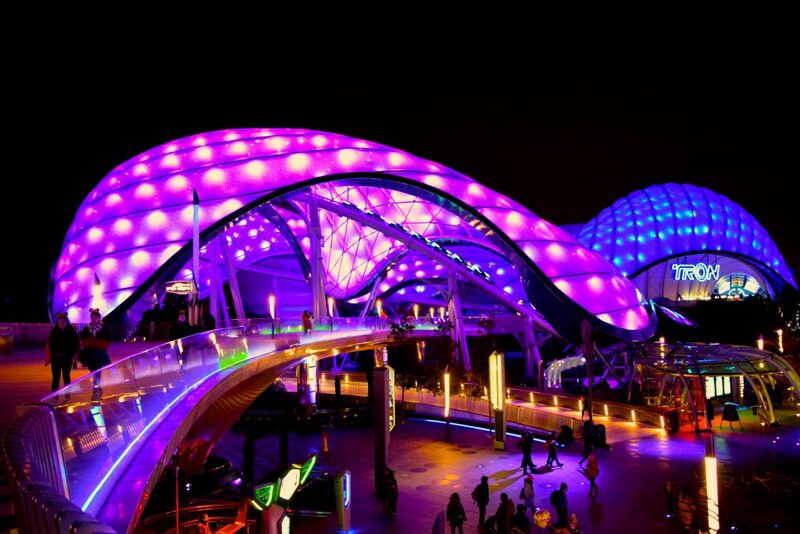 Previous PostPrevious The World isn’t Good Enough for TRON: Lightcycle Power Run, but Walt Disney World Might Be.